Ella Osborn’s 1918 diary provides insight into the experiences of an American nurse serving in France at the end of World War I. 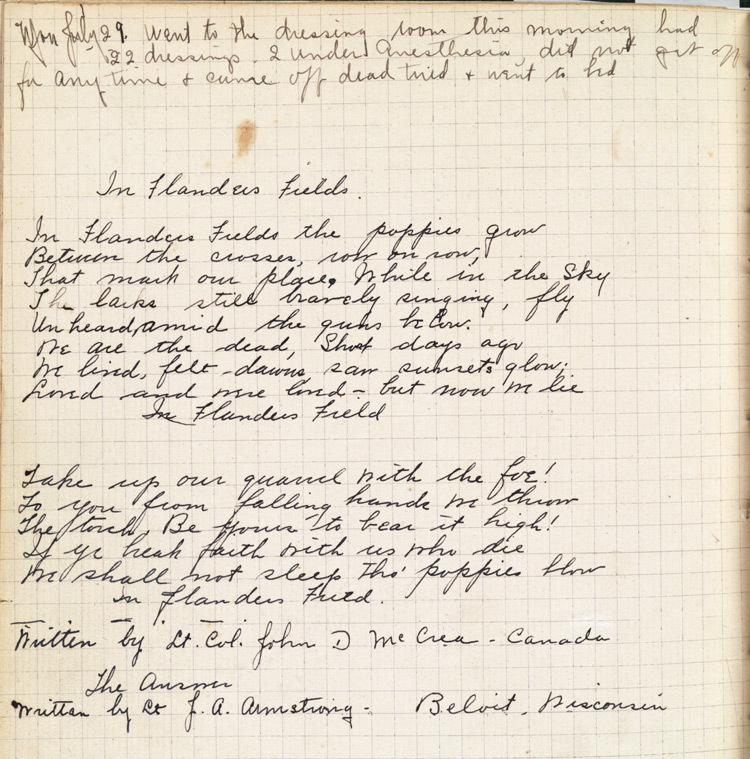 In addition to her notes about the men under her care and events in France, Osborn jotted down two popular World War I poems, "In Flanders Fields," by Canadian surgeon Lt. Col. John D. McCrae, and "The Answer," by Lt. J. A. Armstrong of Wisconsin. McCrae composed "In Flanders Fields" on May 3, 1915, during the Second Battle of Ypres, Belgium. It was published in Punch magazine on December 8, 1915, and became one of the most popular and frequently quoted poems about the war. It was used for recruitment, in propaganda efforts, and to sell war bonds. Today the red poppy of McCrae’s poem has become a symbol for soldiers who have died in combat. Osborn’s transcripts of the poems contain some textual differences from the published versions. Based on the ink used in the diary entries and the ink used in the verses, it appears she went back in her diary to find empty pages to include the poems. Unheard, amid the guns below. The torch, Be yours to bear it high! Shall wake you not; for all is well. A transcript of Ella Osborn’s diary from July 29–30, 1918, is available here. How did John D. McCrae and J. A. Armstrong depict the horror of battle in their poems? Refer to specific lines in each poem to support your answer. Why do you think Ella Osborn included in her 1918 diary poems published three years earlier? To what extent did poems such as these serve to remind citizens of Canada and the US of the importance of supporting the war effort? Propaganda for the Allied war effort included touring shows, motion pictures, posters, and songs. In this context, how can we explain the effectiveness of these poems in shaping public opinion about the war? Both poems are available with their correct and original wording on reliable websites. Note the textual differences and determine whether the changes made by Ella Osborn detract from the original phrasing. How should archivists / historians interpret these “edits”? Research Lt. Col. John D. McCrae. How did his experiences during the war influence his poem “In Flanders Fields”?